GIFT SETS FOR THE BEER NERD ON YOUR LIST! The Holidays are upon us! If Santa is needing some last minute gift ideas for the beer nerd close to you, then he's come to the right place! We have quite a few gift sets to offer. Here is the list; check it twice to find them something very nice! Sierra Nevada is a powerhouse in the craft beer world. This is a limited edition release they do in honor of the Abbey ales of the almighty Belgium. Sierra Nevada's three pack of 750 ml bottles includes the Abbey Brown Ale with mandarins and cocoa, the Abbey Quad with cherries and the Abbey Saison with sage. This gift set is sure to be a hit with your beloved beer nerd. It's a limited edition, so come and get them while you can. Ommegang does some awesome stuff. I think they make some of the best Belgian style beers on this side of the Atlantic. This set of three 750 ml bottles features some of their mainstay beers--and an authentic Ommegang glass! The set includes Chocolate Indulgence Stout, Hennepin Saison and Three Philosophers. This is an awesome gift set that Santa will surely be praised for. Piraat is household name when it comes to Belgian beer. Brouwerij Van Steenberge has been around since 1784 so they've had 233 years to perfect their brews. And they have! 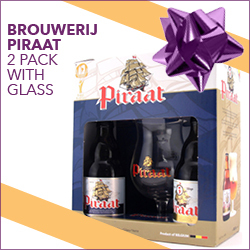 This two-bottle set includes the Piraat Belgian ale and Piraat Triple Hop Dry Hopped ale and an awesome Piraat gold-rimmed tulip glass. If your beer nerd is a fan of old world beer, they will be very pleased with this gift set. Of all the gift sets we offer, this is my favorite. Castle Brouwerij makes the original beers of Belgium. Offered in this pack are the Bacchus Flemish Oud Bruin, the Fond Tradition Gueuze and Fond Tradition Kriek. Sour beers have gained a lot of popularity in the past year and if your beer nerd likes sours, this is the gift set they need. If you're having trouble coming up with some last minute gifts, you will find something on this list. The season has just begun, so it is possible we could be getting more sets in the coming weeks. I am also happy to put together a personalized gift set upon request! As always, you can follow us on UNTAPPD at Colonial Wine & Spirits to see what we have to offer and my personal UNTAPPD (jliddy09) to see what beers I've been trying lately.